Before home bakers had ready access to piping bags (or pastry bags) and a wide variety of tips, professionals were learning the new techniques and keeping them secret. Born in France, Urbain Dubois (1818-1901) recalled years later (1870) that "even till about twenty years ago, the initiated in this work, still kept it a secret. It was at Rome, where I saw for the first time [as "a young man"] 'pieces montees' executed in icing-sugar by a confectioner and pastry-cook (confiseur-palissier); who made this art his sole study and occupation...the handling of the cornet is not familiar to every one; and it is only, after a long and constant practice, that success may be expected." 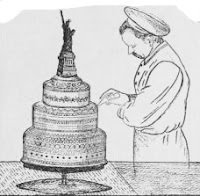 Francatelli (briefly Queen Victoria's chef) gave a short mention in his 1846 book: “piping, as used for wedding cakes.” in a recipe for Napolitain Cake, a la Chantilly. In 1858 he wrote a paragraph: "PIPING. A kind of decoration made of icing, used for ornamenting cakes, pastry stands, small pastry...place the icing or glazing (a mixture of finely-pounded sugar and white of egg worked into a smooth and firm paste) in the cornet or forcer, the upper part of which must be completely closed; the glazing is then forced out at the point by pressure of the thumb on the upper part of the cornet." The earliest (and long) description I have found thus far, is by the British chef George Read in his 1842 work The Guide to Trade: The Confectioner (see below). Writing paper made into a cone, point cut very straight with scissors or used various "pipes" of tin. "The gut of the ox, now much used for tying over preserves instead of bladders, as it is much clearer and has no veins; these are of different dimensions" and Read preferred it over paper cones. "By its nature this piece belongs to the composite; that is to say it is formed partly of gum-paste, and partly of icing-sugar; this style although new, or properly speaking, because it is new, merits all the attention of the practitioners...The hollow of the arch is filled with lattice-work in icing-sugar, squeezed through a cornet on plates of glass, dried, detached, and covered, on the interior side, with transparent and colored leaves of isinglass (gelatine), or simply with painted paper: these lattices are applied in imitation of Gothic glasswindows (vilraux), therefore they must be light and very regularly marked." the point is then cut with a sharp knife or scissors, so as to make a hole sufficiently large to form the icing, when squeezed or pressed out, in a thread of the required size, and which will either be fine or coarse according to the length of the point which is cut off. If the hole at the point of the cone is not perfectly straight when the icing is pressed out, it will form a spiral thread, which is very inconvenient to work with. Stars borders, flowers, and different devices, are formed on cakes after they are iced, the execution of which depends on the ability and ingenuity of the artist. Baskets, Chinese, and other temples, &c., are formed on moulds by these means, first giving them a coating of white wax, which is brushed over them after it is melted, and when cold, the icing is formed on it like trellis-work; when finished the mould is warmed, and the icing easily comes off. 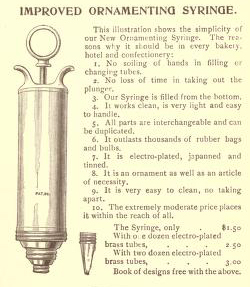 Some of the pipes which are used cannot be formed with paper, as the tape and star-pipes, which are made of tin, having a bag fastened to them in a similar manner to that generally used for dropping out Savoy biscuits, macaroons, &c., only much smaller, the point of the tin tube of the one being fluted to form a star, and in the other it is flat, so that when the icing is forced or squeezed through, it comes out in a broad thin sheet, like a piece of tape. I employ a set of pipes made of tin, with small bags fastened to them, which are made from the gut of the ox, now much used for tying over preserves instead of bladders, as it is much clearer and has no veins; these are of different dimensions; the orifice of the round ones commences at the size of a common pin, and the tape pipes from a quarter to half an inch in width. I find these much better than paper ones, as the trouble and time which is lost in constantly making new ones is amply repaid by the others, as they are not very expensive and are always ready for use. 215. To Make Flowers for Cake Ornaments. Flower making of icing and gum paste is a trade of itself and it is generally cheaper to buy than to make them. But it often happens that the ready made article is not obtainable and we must do the best we can. Pound, and sift some treble-refined sugar through a lawn sieve, and put it into an earthen pan, which must be quite free from grease ; to each pound of sifted sugar add the whites of three eggs, or sufficient to make it into a paste of a moderate consistence, then with a wooden spoon or spatula beat it well, using a little lemon juice occasionally, and more white of egg if you find that it will bear it without making it too thin, until you have a nice light icing, which will hang to the sides of the pan and spoon; or, if it is dropped from the spoon, it should remain on the top without speedily losing the form it assumed. A pan of icing, when well beat and finished, should contain as much again in bulk as it was at the commencement: use sufficient lemon-juice to give the icing a slight acid, or it will scale off the cake in large pieces when it is cut. Many prefer the pyroligneous acid to lemonjuice, but the flavour is not so delicate, and it always retains a smell of the acid; neither did I ever find, as some assert, that it improves the quality and appearance of the icing; the only advantage derived from it is that of economy. Eight ounces of sugar, passed through a silk tammy; white, dry, and without any lumps; are put into a glazed basin, and mixed up with the white of an egg and a half, and a few drops of citric-acid; the whole is worked with a wooden spoon, stirring from right to left; ten minutes afterwards, it will begin to become consistent; the working is continued for seven or eight minutes longer; and when the sugar adheres to the spoon without dropping off, a little blue is added; a few spoonfuls of potato-flour are introduced, the whole stirred for a few seconds more, and covered with a damp cloth, so as to prevent the surface from getting dry. In some cases, the potato-flour is replaced by a spoonful of cream of tartar or a pinch of pounded gum-dragant; the potato-flour being preferable, as the construction of ornaments and borders requires some solidity, and this addition to the icing-sugar tends to render it more consistent, and to aid its drying. 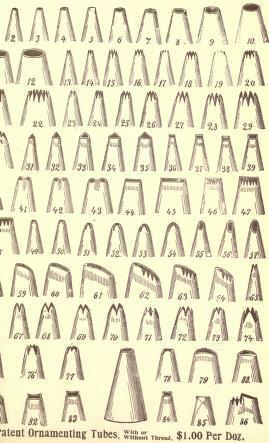 In this condition, it can be squeezed through a cornet, to form either round, straight, or correct lines, as well as for the execution of hanging borders. The icing-sugar may be colored; but the use of liquid colors, in too large a quantity, must be avoided; as this would destroy its consistency.